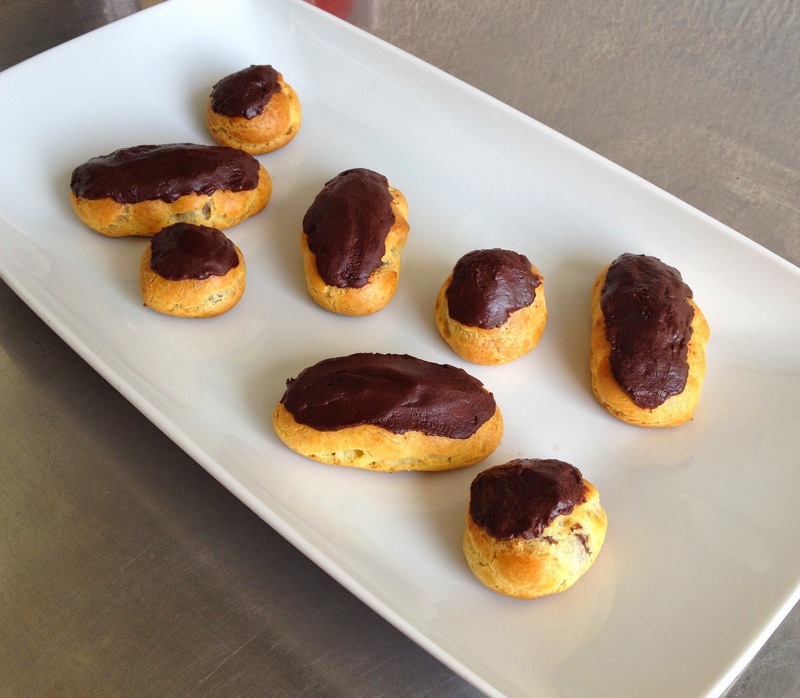 Eclairs au chocolat, a French dessert par excellence, can be made within 1 hour if you are well organized. Don't be discouraged by the number of steps in the recipe, every component can be made quite quickly, and the reward at the end is totally worth the effort. Enjoy! In a saucepan heat up milk, water, salt, sugar and butter. When butter is melted bring to a boil and remove from the heat. Add flour all at once and mix fast with a wooden spoon. Put back on the fire and continue mixing until the dough is compact and detaches from the sides (this step is to dry or dehydrate the dough). Transfer dough to a cold bowl and wait 5 min for the dough to cool down a bit. Add eggs one by one, mixing vigorously in between each with a wooden spoon. Transfer dough to a piping/pastry bag with a round nozzle and lay down éclairs or puffs (as you prefer) on an oven plate lined with parchment paper. 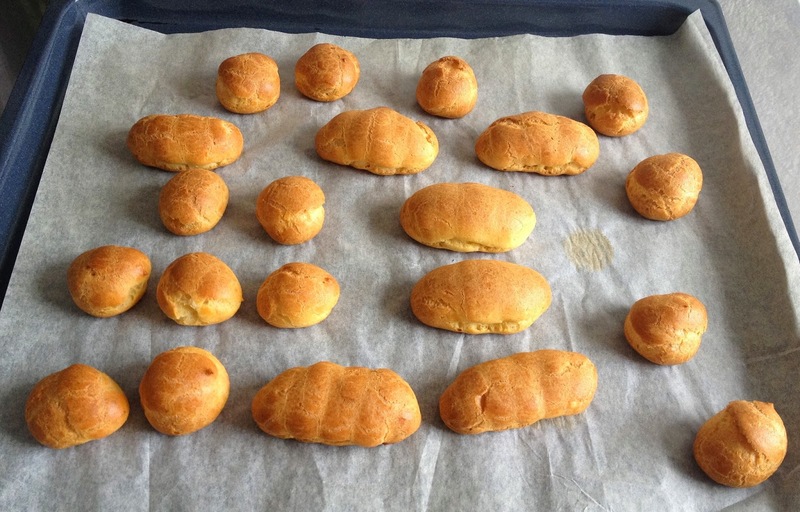 For éclairs I suggest making 3 x 10 cm shapes and for puffs something around 3-5 cm. Bake in the oven 25-30 min at 180 C, until golden brown. Chop up or grate chocolate and transfer to a bowl. Beat up egg yolks and powder sugar until whitish and fluffy. In a saucepan heat up milk, corn starch and powder sugar while mixing with a whisk. Bring it to a boil and then remove from heat. Add some of the milk mix to the egg mix and whisk. Add back to the sauce pan and put back on the fire. Whisk and bring to a boil. Remove from the heat and pour on top of the chocolate in a bowl. Mix until the chocolate is melted. Cover the cream with plastic foil and refrigerate for 20 min. 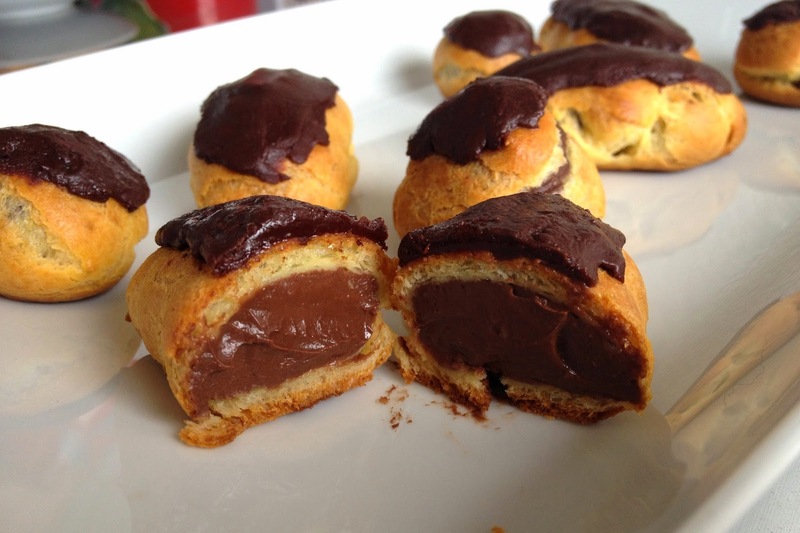 Poke a hole in the puffs or 2 wholes in the éclairs (on the bottom surface). Transfer the pastry cream to a piping bag with a small nozzle and fill the puffs/éclairs via the hole(s) you just made. Heat up the cream and add to the chocolate. Mix until the chocolate has melted. Dip the upper surface of the éclairs in the glacage and let it dry. Now you can enjoy your éclair au chocolat!